Enough books to start our own library! What a week it has been, dear Reader. There has been so much to do in the cottage. Estate agents are descending on us for valuations and Jerry and I have been frantically trying to tidy and declutter so that the agents value the dear old building at more than 5p for lock, stock and barrel. 6 years we have lived here. Moving from the hustle, bustle and gritty urban life of an SE London post code to the serenity and predictably middle class suburbia on the edge of Richmond Park. In that time, the cottage has weathered many storms: Jerry’s beginner DIY skills, my obsession with green paint and not least the arrival of our fluffy prince Bertie, followed by our two little darlings, Primrose and Poppy. Its four walls have been the source of both great joy and terrible woe as one thing after another ceased to function as it was supposed to. Yet through all of that, it has remained one of my greatest loves. Indeed, it was love in the first place, Dear Reader, that caused me to purchase the ramshackle bricks and mortar we now call home. In a fit of impetuousness, I decided on first viewing to buy it. Jerry was on a stag weekend at the time and was ‘delighted’ when he received a phonecall from his wife saying that she had purchased a house! I saw the cottage, fell in love and made a foolish decision that left Jerry and I to pay the asking price even though the house was in need of considerable modernisation. When asked by the estate agent (and the vendor) whether I wanted to wait until my husband returned to make a formal offer, I glibly said “No, Jerry won’t mind!” Jerry has never let me forget that moment of rashness in the entire 6 years we have lived here! I have lived and breathed the house ever since from sourcing Victorian wallpapers to underpinning chimneys, converting the attic into a third bedroom, ripping out the 70s decor, installing a new kitchen (with a newborn Primrose in tow) and weeping every time the roof leaked and water poured through the ceiling and down the walls in the middle of the night. One can only say that the cottage has been a true labour of love. Jerry has, on numerous occasions, told me (through gritted teeth) that I would not be allowed to look at or buy houses alone in the future and that the only house he would consider living in now, would be a modern box. Interesting…as only a few days ago, I caught him trawling through properties on Rightmove which boasted period features and oak beams. However, I do feel an immense responsibility to prove to Jerry that all the time and effort spent on the cottage has been worth it and that someone as mad as Margot will fall in love with it, want to move straight in and make us a ludicrous offer! 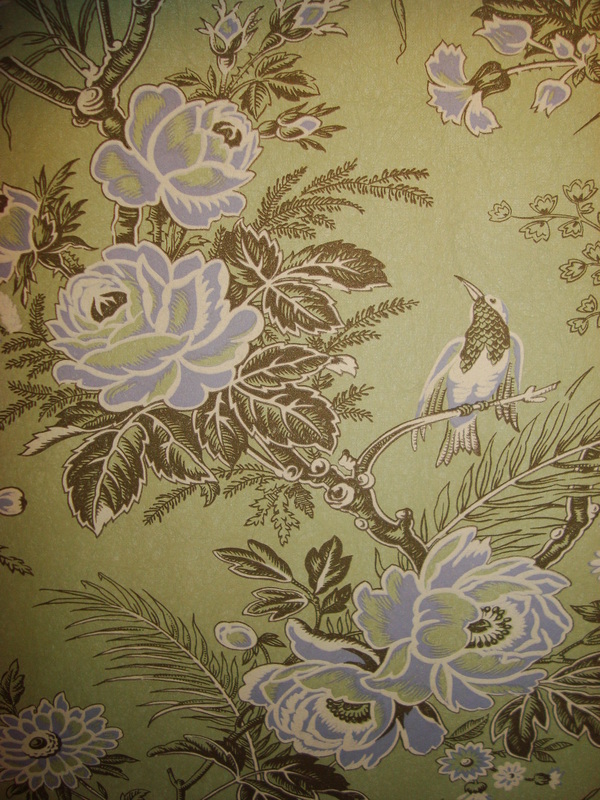 Wondering if I could ever be parted from my beloved cottage, Jerry rather glibly imparted, “Buyers might not love your wallpaper as much as you do.” What a simply ridiculous notion! Well if they don’t love the wonders of Lewis&Wood wallpaper then they clearly do not have an eye for vintage beauty and I won’t be selling the house to them! Hmm. With all the tidying I missed the whooping excitement of a crisp clean blanket of snow. I felt a perfect winter Grinch as I watched others sledging down hills in the park, whilst I gave myself white blindness of a slightly different sort, painting the bay window. DIY capers continued into the weekend when Jerry and I used some tester pots to retouch areas in the kitchen and bathroom. Sadly for us (we saw the funny side only much later on) it turned out that the Farrow and Ball paint we thought we had used in the first place, did not match the little pots. Too late to do anything about it when one has painted a great big patch and could only tell the difference in pantones when newly painted area is bone dry….. Jerry and I spent a few hours mixing different F&B pots together until we finally reached the desired shade and then had to repaint the section all over again! More grumbling ensued. Onwards to the decluttering…… I have to confess to liking a little clutter so I knew that this part of the operation was going to be a challenge. 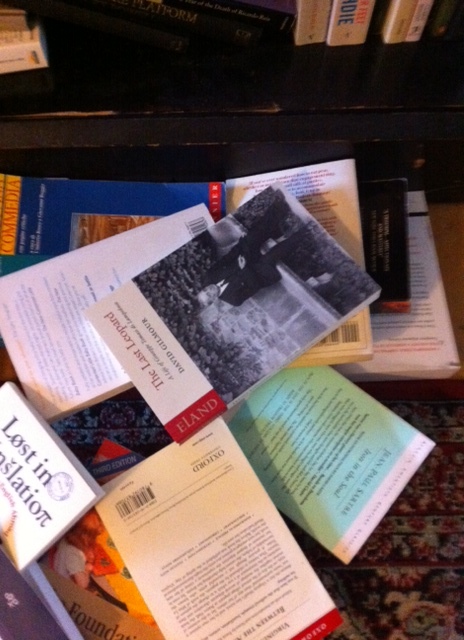 Clean lines have never appealed and I hoard books as if I shall never see another again. Advice from the lovely Kirstie Allsop’s friend, Phil, on selling a property says that the key to a sale is to ‘declutter’ and ‘de-personalise’. Buyers want to imagine themselves in your house. Oh dear, I thought. Might have to box up most of our things in that case! “Don’t you like any of your things anymore, Mummy?”, asked a rather outraged Primrose, our resident magpie and lover of shiny pretty things, as she watched me taking things out of cupboards and ramming once loved items into black bin bags ready for the charity shop. Halfway through, even Jerry was concerned that I seemed to have cleared out half of my wardrobe and had decimated my herculean handbag collection. (I have always maintained that one needs a good handbag for every possible occasion! At last count, I had managed to collect in the region of fifty something…). Nevertheless, I was an unstoppable machine and in one weekend, 6 years of cottage life was streamlined and decluttered. Poppy did her very best to prevent the proceedings by throwing Primrose’s Mister Maker box onto the floor. 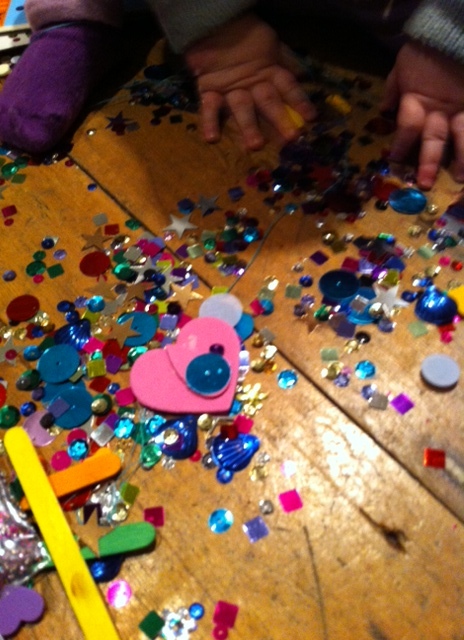 Sequins, googly eyes and heaps of glitter spilled out onto the floor just as the vacuum cleaner had been returned to the under-stairs dungeon. I can’t repeat the language used but I am sure you can imagine, dear Reader! For sale: One cottage covered in sequins and googly eyes. Toddler to be thrown in with purchase. Hours of cleaning duty later and Jerry and I were more than ready for Gin o’clock! The realisation that we are selling up has set in. Surveying our handiwork, Jerry and I felt like our dear little cottage had been stripped bare. I wondered how on earth I was going to be able to keep the clutter at bay. Not least because in a fit of impatience, Jerry stuffed the last of the unhomed items (precariously balanced no doubt) behind a few cupboard doors! Let’s hope any potential buyers don’t feel the need to check out the storage….. Snow now melted away, a new week dawns and for now, dear Reader, the sun is shining. The cottage is looking pristine. You will be pleased to hear that amidst all the clearing out, I did manage to find room for ONE new little purchase. 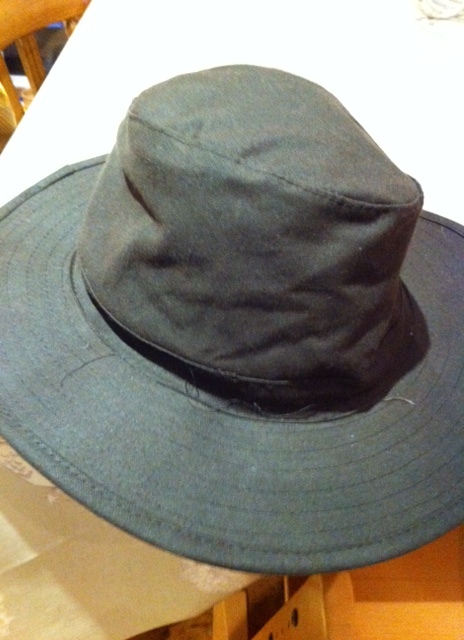 A country hat. Well…..it was winking at me from its lonely spot in a shop window and I couldn’t possibly leave it behind. It was clearly a sign. Out with the old, in with the new as they say! No19 on the list : Procure a stylish country hat. DONE! This entry was posted in Country Sense, Uncategorized and tagged clean, clutter, cottage, declutter, estate agents, Farrow and Ball, hoard, Lewis&Wood, new, old, paint, tidy on January 28, 2013 by admin.